RN, BA, MHA, CHPCN(C), CVAA(C) - Nurse Educator - William Osler Health System, G.T.A. Valrie began taking courses with de Souza Institute in 2010, and soon began working towards an APN Designation. This entailed a research project, one hundred and fifty hours in a clinical fellowship and completion of the required courses towards obtaining over 4.0 credits. Valrie currently works at the Etobicoke General Hospital site of the William Osler Health System as a Clinical Nurse Educator. 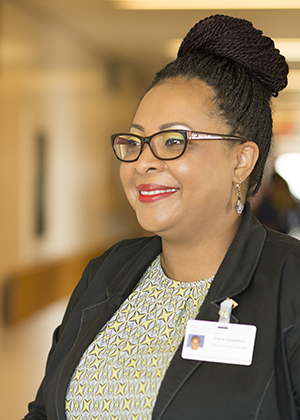 In an educator role herself, she is immersed in the importance of continuing on with professional development in order to provide patients with optimal palliative care. Being witness to the gaps in knowledge about palliative care issues, Valrie chose to develop an educational brochure regarding advance care planning for patients and families. She also facilitated interdisciplinary staff training on how to incorporate advance care planning as part of discussions during the inpatient admission phase.